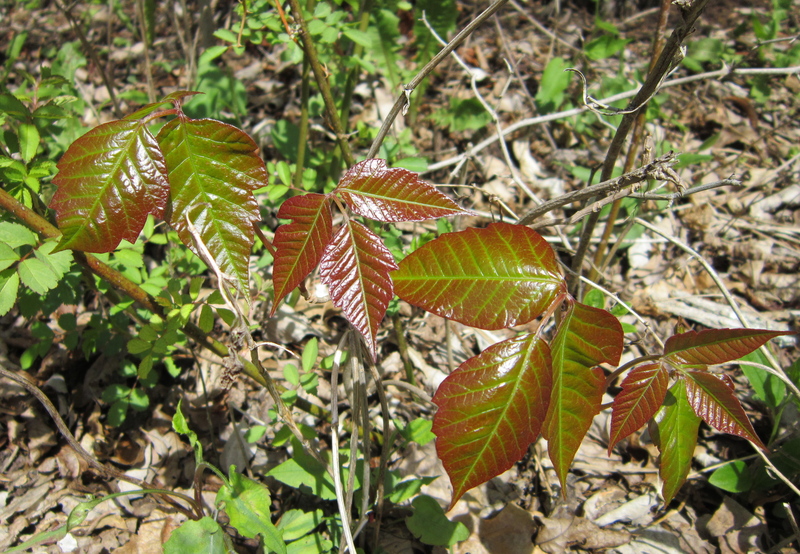 Not many things give me nightmares, but poison ivy—Toxicodendron radicans—is one of them. I didn’t even know what the blighter looked like when I started gardening in New York’s Hudson Valley. Vague ideas of Christmas card’s wreathed in leafy loveliness came to mind, and I imagined some minor skin irritation akin to the hives from a stinging nettle. Boy was I in for a shock. One night I was awoken by an intense itching on the insides of my arms: I’d met my nemesis. But this noxious weed wasn’t going to get the better of me! I put on my armor—heavy-duty gardening gloves, long-sleeved sweatshirt, jeans, and boots—and waded into battle. I even went so far as to ditch my old clothes once I’d beaten my enemy into submission. It didn’t help. The urushiol—the toxic sap of the plant—worked its way under my defenses. I looked like a burn victim, with oozing bandages swaddling my arms and shins. And don’t talk to me about the excruciating itch that made me tear at my skin like a mad woman. I tried every remedy in the almanac—oatmeal baths, jewel weed, calamine lotion, cortisone, baking soda, bleach. Yes, you heard that last one right—neat bleach! They all worked to a degree. But the bottom line is that once the angry rash and blisters appear, you have to resign yourself to three weeks of hell. So it’s no wonder that walking past a lush patch of poison ivy on the roadside is enough to give me sleepless nights. And when a seedling dares to rear its not-so ugly head in my garden, it makes me break out in a cold sweat and reach for the Round-up. Recently I learned an even more disheartening fact: A study by researchers at the University of Georgia found that poison ivy is particularly sensitive to CO2 levels, greatly benefiting from higher CO2 in the atmosphere. 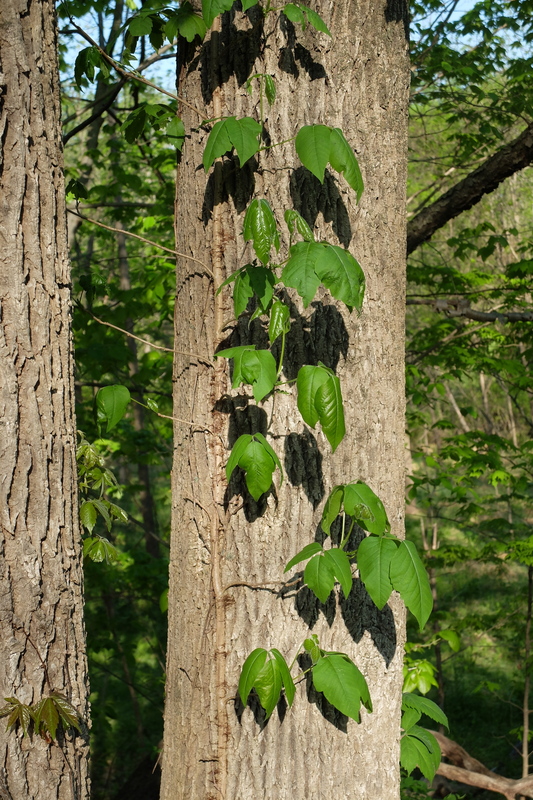 Poison ivy’s growth and potency has already doubled since the 1960s, and it could double again once CO2 levels reach 560 ppm David Templeton (July 22, 2013). 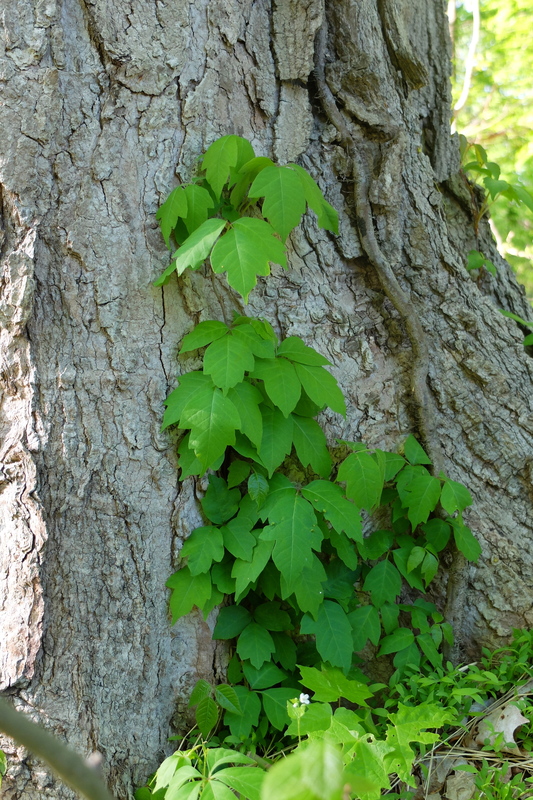 “Climate change is making poison ivy grow bigger and badder”. Pittsburgh Post-Gazette. So, unless you fancy a post-apocalyptic world over-run with vast jungles of poison ivy, curb your CO2 emissions! This entry was posted in Photography, Woman With Landscape, Write Eejit and tagged CO2 levels, gardening, nature, photography, Poison ivy, spring, writing on May 23, 2014 by Melissa Shaw-Smith. Oh, that’s very bad news to hear that poison ivy is getting worse. I remember trying to keep my children out of patches of it years ago in New Jersey. It’s so hard to get rid of that rash. One more reason for trying to keep noxious emissions down. True. My son had a very unpleasant encounter with poison ivy while playing in the woods with a friend. I’ll bet he has nightmares about it too! poison must be one of the most costly plants to society when taking into acct. doctor visits,the shots, the thousands of gallons of calamine lotion,steroids,ect.ect.ect. thanks for your post, but i’m now scratching at imaginary bumps on the inside of my wrists! Good point! Hadn’t thought of that. Thanks for this informative post. So good to know what poison ivy looks like. At the age of about 8 while visiting a schoolmates house, I clearly remember his mother coming out the back door and screaming aloud in terror as I wallowed in the head high poison ivy patch behind their lawn. Not having a clue as to what she was so upset about, I went home to ask my mom about it. She explained to me what it was, and that was that. I wasn’t affected in the least, no bumps, no rash, no muss no fuss. Since that moment of education however, the mere sight of those shiny green leaves gets me to itchin’ an’ a twitchin’… the ensuing horrific episodes of blisters and woe are to numerous to recount here. Poison ivy follows humans and their disturbance of the landscape like obedient and hungry canines, it will emerge from the horse dung and the cow manure, the dozer piles and the clearcuts, lining the pathways, roads and lawns that mankind compels itself to create. Totally opportunistic, the warming climate will only embolden and empower it’s chokehold on every patch of ground we clear. That’s the bad news, and, sorry, I don’t think there’s any good. Thanks very much for your interesting comment. I had no idea you didn’t get poison ivy in Oregon. Lucky you! But as you say, can’t help but have nightmares about it making it’s insidious way across the continent. I do find it perversely beautiful to look at though–even those thick, hairy vines winding their way around tree trunks. Those massive fuzzy vines climbing into the canopy, and the brilliant red of the late season leaves are very beautiful, from a distance. I’m in the coastal mountain ranges of Oregon, very wet climate, this may be why I have not seen it here. It’s possible, even likely that east of these ranges into the Willamette Valley and heading further east it would be found. One of the most surprising places I have seen it was in the Gila Wilderness of New Mexico, along streamside trails frequented by horse riders. 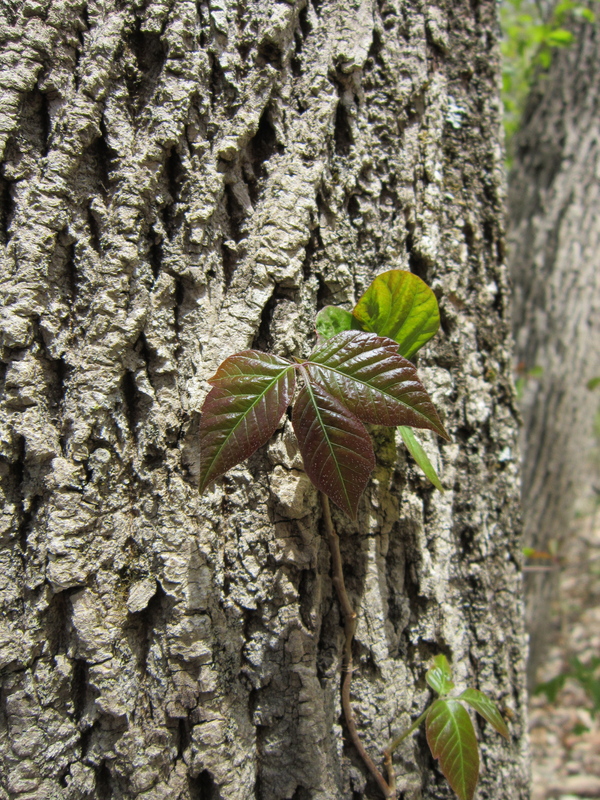 There’s another nasty species not to far south into Northern California: Poison Oak. It can be far worse than the ivy, get it bad once and it’s necessary to avoid it forever after that.